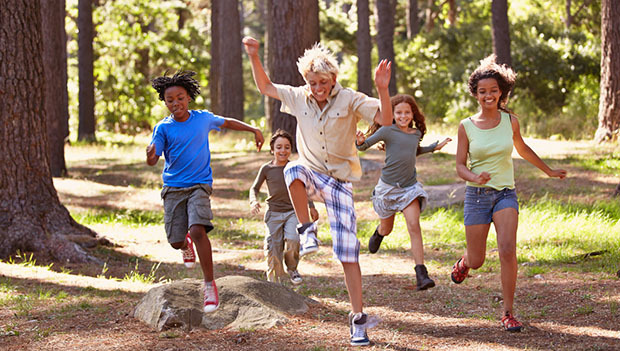 Campgrounds, with their winding roads, open spaces and linked trails make a great outdoor playground for kids. These five no-tech games will keep kids (and adults!) active and having fun for the entire camping trip. Don't worry too much about the exact rules, just bring some friends and get ready to run, jump, hide, laugh and make memories at the campground. A cross between hide and seek and tag, Kick the Can was once a popular game worldwide. Place a can in an open space at dusk. One player, who is "It," counts while the other players hide. The object is to get to the can and kick it without being seen by the person who is "It." Players are considered out when the person who's "It" sees them and calls out their name. The game ends when someone kicks the can or all the players are seen and caught. There are several other versions, including physically tagging players to catch them, building a "jail" for players who are out and kicking the can to release players from jail. A staple of summer camp, Capture the Flag translates well to the campground. Divide a playing area into two sides--a larger space can be great for teens and tweens while a single campground spot may be enough for little tykes. Divide into two teams and have each team mark a "jail" area then hide a flag on their side. The object is to find and take the other team's flag before crossing safely back to their own side. Players are "in jail" if they are tagged while on the other team's side. In some versions, players can get out of "jail" if a teammate tags them. For more fun, include the adults! With a younger group, spread the adults evenly between teams. Have older kids? Try playing adults versus kids. Half the fun of camping is climbing over stumps, walking across fallen logs and jumping through streams. Use these natural features to build an obstacle course, then send the kids through it. With a little creative thinking, the same course can be easy for smaller kids or more challenging for teens. Does your group like competition? Make it a race! Not into that? Emphasize how fun it is to try new things outside. Hide in a tree stump, behind a rock or in a tent. In this modification of hide and seek, one person hides while the other players cover their eyes. The goal is to find the hidden person and hide alongside them, making the space more and more cramped--like a can of sardines! This game is great for giggles as everyone squishes into a small space. Playing outdoors adds an element of excitement to this classic game. With no closets, curtains or beds, kids have to blend into the natural setting. As an added bonus, searching for hiding spaces is a great way to get to know a campground. If you are playing with younger kids, make sure to set clear boundaries away from water or other hazards. For families willing to bring a little equipment, these activities encourage togetherness, fun and adventure. Ladder Ball: In this game, three-tier ladders are spaced about 15 feet apart. Players throw bolas, with points awarded when the bola catches on a rung. Slackline: String the slackline between two trees, and practice balancing, walking, jumping and tricks. The kids can even work together to help each other to the other side. Four-Square and Kickball: All you need is some chalk and a playground ball. Build your squares or draw your bases and start playing. Bring some wheels: Use bikes, scooters and balance bikes to explore the campground. Your child might even learn to ride here.